this beautiful and extensively updated home comes complete with nothing to do, but move in and put your feet up! main level offers stunning, oversized polished porcelain flooring and wainscoting throughout the foyer, office and powder room. open concept kitchen/living/dining, 9ft vaulted ceilings complete with porcelain tile throughout. upstairs you will find 3 generous sized bedrooms and a full bath all decorated in neutral dcor. finished lower level offers pre-wired surround sound for movie nights in and dont forget about your private back yard oasis, surrounded by mature cedars and massive two tiered deck, great for entertaining! 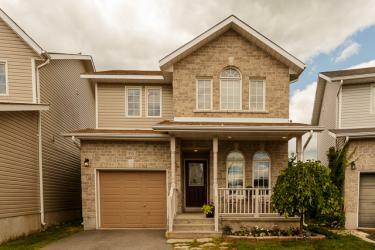 this gem is located in popular greenwood park, close to cfb kingston, trails, shopping and schools.